I'm not sure I would serve these dishes together but individually they are quite good. Citrus is delicious used in savory ways - it adds freshness and acidity. This lemon pasta is very lemony. I used a lemon pasta which made it even more tart. We enjoyed it - I've given a couple of ideas of ways to make it more of a main dish at the bottom of the recipe. Bring a large pot of water to a boil. Salt the water and drop the spaghetti into the pot. Heat a large deep skillet over low heat. Add extra-virgin olive oil and garlic and crushed red pepper flakes. When the pasta has been cooking about 5 minutes, add lemon juice, a ladle of the cooking water from the pasta and the cream to the garlic and oil. Raise heat a bit to bring sauce to a bubble. Drain pasta when it still has a good bite to it, al dente. Add lemon zest and half of the cheese to the cream sauce. Season the sauce with salt, to taste. Add pasta to pan and turn off heat. Toss the pasta with sauce a minute or 2, allowing it time to soak up the sauce. 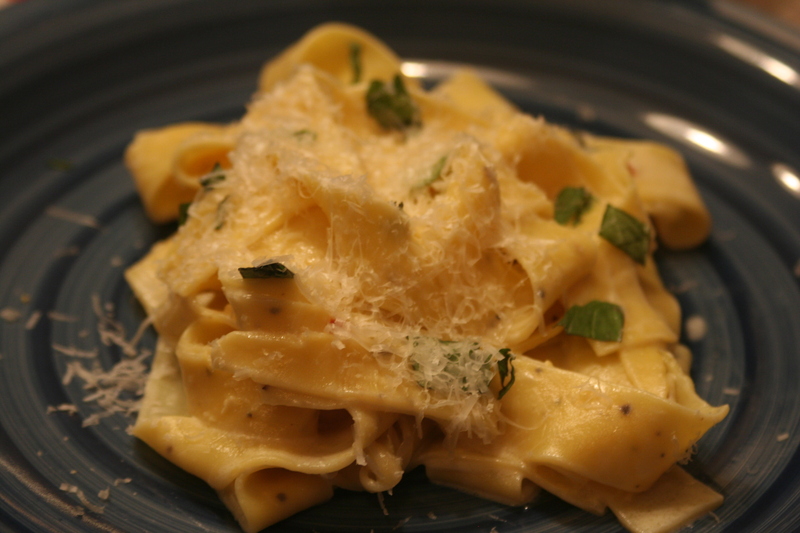 Top the plates of pasta or platter with remaining cheese, parsley and basil. *This would be excellent with broccoli and chicken added. Just reduce the amount of pasta to 1/2 lb. and cook 1 head of broccoli florets with the pasta. Drain and toss in sauce along with 1 - 1 1/2 c. chopped cooked chicken. Toss and serve. My youngest son loved the avacado and grapefruit - even with the dijon dressing. We really like this salad - the original recipe does not call for it to be served on the lettuce but we much prefered it served over greens. Overall a delightful and unexpected combination of flavors. It's a beautiful salad to serve as well. Place the mustard, lemon juice, salt, and pepper in a small bowl. Slowly whisk in the olive oil until the vinaigrette is emulsified. Before serving, cut the avocados in 1/2, remove the seeds, and carefully peel off the skin. Cut each half into 8 slices. Toss the avocado slices in the vinaigrette to prevent them from turning brown. Use a large, sharp knife to slice the peel off the grapefruits (be sure to remove all the white pith), then cut between the membranes to release the grapefruit segments. 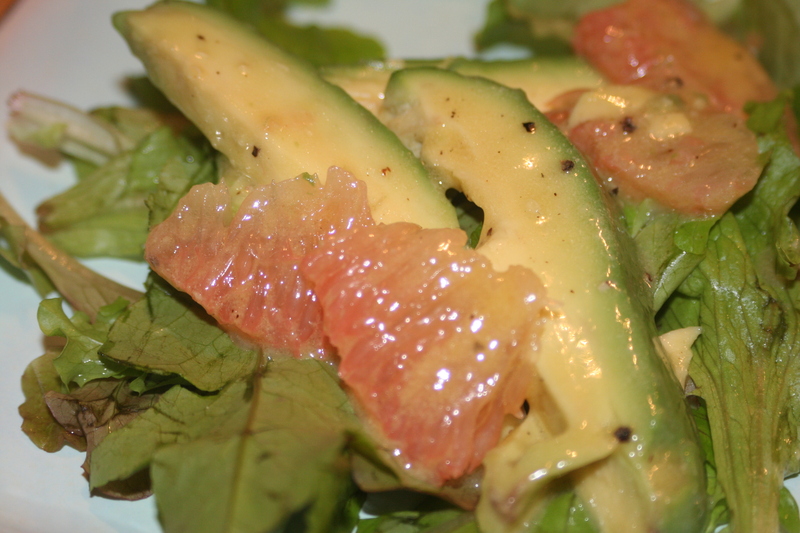 Arrange greens or lettuce on a large platter then top with the avocado and grapefruit slices. Spoon the vinaigrette on top, sprinkle with salt and pepper, and serve. I've never heard of lemon pasta! Do you get it somewhere special? I am definitely trying this one. We LOVE citrus-y stuff!! I found the pasta at Trader Joe's. You can also just use a regular pasta like a linguini! I'm looking forward to making this tonight! It looks yummy and fresh! Also, love the new feature -- print this -- thanks for adding that! I love that pasta! I haven't bought any in a while....hmmm. I think I need to!